Kikuchi N, Satoh K, Saito Y, Shimokawa H. Selenoprotein P promotes the development of pulmonary arterial hypertension: A possible novel therapeutic target. (Authors’ reply) Circulation. 139:724-725,2019. Shibata K, Shimokawa H, Yanagisawa N, Otsuji Y, Tsutsui M. Nitric oxide synthases and heart failure -Lessons from genetically manipulated mice- J UOEH. 35:147-158,2013. Nigro P, Abe JI, Woo CH, Satoh K, McClain C, O'Dell MR, Fujiwara K, and Berk BC. PKCζ decreases eNOS protein stability via inhibitory phosphorylation of ERK5. Blood. 116:1971-1979,2010. Tatebe S, Fukumoto Y, Sugimura K, Nakano M, Miyamichi S, Satoh K, Oikawa M, Shimokawa H. Optical coherence tomography as a novel diagnostic tool for distal type chronic thromboembolic pulmonary hypertension. Circ J. 74(8):1742-1744,2010Aug. Satoh K, Fukumoto Y, Nakano M, Ishii N, Sugamura K, Shimokawa H. Statin ameliorates hypoxia-induced pulmonary hypertension associated with down-regulated stromal cell-derived factor-1. Cardiovac Res. 81:226-234,2009. Satoh K, Nigro P, Matoba T, O'Dell MR, Cui Z, Shi X, Mohan A, Yan C, Abe J, Illig KA, Berk BC. Cyclophilin a enhances vascular oxidative stress and the development of angiotensin II-induced aortic aneurysms. Nat Med. 15:649-656,2009. Satoh K, Matoba T, Suzuki J, O'Dell MR, Nigro P, Berk BC. Cyclophilin A mediates vascular remodeling by promoting inflammation and Vascular Smooth Muscle Cell proliferation. Circulation. 117:3088-3098,2008. Fukumoto Y, Tawara S, Shimokawa H. Recent progress in the treatment of pulmonary arterial hypertension: expectation for rho-kinase inhibitors. Tohoku J Exp Med. 211:309-320,2007. Shimokawa H, Rashid M. Development of Rho-kinase inhibitors for cardiovascular medicine. Trends Pharmacol Sci. 28:296-302,2007. Satoh K, Kagaya Y, Nakano M, Ito Y, Ohta J, Tada H, Karibe A, Minegishi N, Suzuki N, Yamamoto M, Ono M, Watanabe J, Shirato K,Ishii N, Sugamura K, Shimokawa H. Important role of endogenous erythropoietin system in recruitment of endothelial progenitor cells in hypoxia-induced pulmonary hypertension in mice. Circulation. 113:1442-1450,2006. Abe K, Morikawa K, Hizume T, Uwatoku T, Oi K, Seto M, Ikegaki I, Asano T, Kaibuchi K, Shimokawa H. Prostacyclin does not inhibit rho-kinase: an implication for the treatment of pulmonary hypertension. J Cardiovasc Pharmacol. 45:120-124,2005. 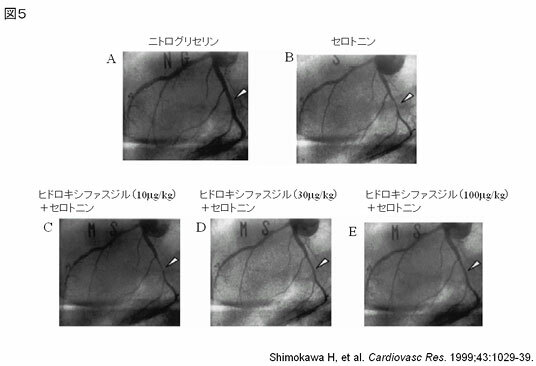 Hiroki J, Shimokawa H, Mukai Y, Ichiki T, Takeshita A. Divergent effects of estrogen and nicotine on Rho-kinase expression in human coronary vascular smooth muscle cells. Biochem Biophys Res Commun. 326:154-159,2005. Shimokawa H, Takeshita A. Rho-kinase is an important therapeutic target in cardiovascular medicine. Arterioscler Thromb Vasc Biol. 25:1767-1775,2005. Yada T, Shimokawa H, Hiramatsu O, Kajita T, Shigeto F, Tanaka E, Shinozaki Y, Mori H, Kiyooka T, Katsura M, Ohkuma S, Goto M, Ogasawara Y, Kajiya F. Beneficial effect of hydroxyfasudil, a specific Rho-kinase inhibitor, on ischemia/reperfusion injury in canine coronary microcirculation in vivo. J Am Coll Cardiol. 45:599-607,2005. Abe K, Shimokawa H, Morikawa K, Uwatoku T, Oi K, Matsumoto Y, Hattori T, Nakashima Y, Kaibuchi K, Sueishi K, Takeshit A. Long-term treatment with a Rho-kinase inhibitor improves monocrotaline-induced fatal pulmonary hypertension in rats. Circ Res. 94:385-393,2004. Hattori T, Shimokawa H, Higashi M, Hiroki J, Mukai Y, Kaibuchi K, Takeshita A. Long-term treatment with a specific Rho-kinase inhibitor suppresses cardiac allograft vasculopathy in mice. Circ Res. 94:46-52,2004. Hattori T, Shimokawa H, Higashi M, Hiroki J, Mukai Y, Tsutsui H, Kaibuchi K, Takeshita A. Long-term inhibition of Rho-kinase suppresses left ventricular remodeling after myocardial infarction in mice. Circulation. 109:2234-2239,2004. Hiroki J, Fukumoto Y, Shimokawa H, Hirooka Y, Takeshita A. Inhibition of Rho-kinase by fasudil preventing anginal attacks associated with spastic angina: a case report. J Cardiol. 44:161-164,2004. Hiroki J, Shimokawa H, Higashi M, Morikawa K, Kandabashi T, Kawamura N, Kubota T, Ichiki T, Amano M, Kaibuchi K, Takeshita A. Inflammatory stimuli upregulate Rho-kinase in human coronary vascular smooth muscle cells. J Mol Cell Cardiol. 37:537-546,2004. Shiotani S, Shimada M, Suehiro T, Soejima Y, Yosizumi T, Shimokawa H, Maehara Y. Involvement of Rho-kinase in cold ischemia-reperfusion injury after liver transplantation in rats. Transplantation. 78:375-382,2004. Higashi M, Shimokawa H, Hattori T, Hiroki J, Mukai Y, Morikawa K, Ichiki T, Takahashi S, Takeshita A. Long-term inhibition of Rho-kinase suppresses angiotensin II-induced cardiovascular hypertrophy in rats in vivo: effect on endothelial NAD(P)H oxidase system. Circ Res. 93:767-775,2003. Mohri M, Shimokawa H, Hirakawa Y, Masumoto A, Takeshita A. Rho-kinase inhibition with intracoronary fasudil prevents myocardial ischemia in patients with coronary microvascular spasm. J Am Coll Cardiol. 41:15-19,2003. Kandabashi T, Shimokawa H, Mukai Y, Matoba T, Kunihiro I, Morikawa K, Ito M, Takahashi S, Kaibuchi K, Takeshita A. Involvement of rho-kinase in agonists-induced contractions of arteriosclerotic human arteries. Arterioscler Thromb Vasc Biol. 22:243-248,2002. Masumoto A, Mohri M, Shimokawa H, Urakami L, Usui M, Takeshita A. Suppression of coronary artery spasm by the Rho-kinase inhibitor fasudil in patients with vasospastic angina. Circulation. 105:1545-1547,2002. 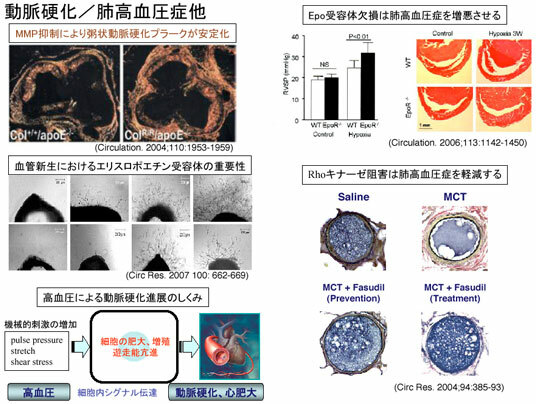 Satoh S, Ikegaki I, Toshima Y, Watanabe A, Asano T, Shimokawa H. Effects of Rho-kinase inhibitor on vasopressin-induced chronic myocardial damage in rats. Life Sci. 72:103-112,2002. Shimokawa H, Hiramori K, Iinuma H, Hosoda S, Kishida H, Osada H, Katagiri T, Yamauchi K, Yui Y, Minamino T, Nakashima M, Kato K. Anti-anginal effect of fasudil, a Rho-kinase inhibitor, in patients with stable effort angina: a multicenter study. J Cardiovasc Pharmacol. 40:751-761,2002. Shimokawa H. Rho-kinase as a novel therapeutic target in treatment of cardiovascular diseases. J Cardiovasc Pharmacol. 39:319-327,2002. Ikegaki I, Hattori T, Yamaguchi T, Sasaki Y, Satoh SI, Asano T, Shimokawa H. Involvement of Rho-kinase in vascular remodeling caused by long-term inhibition of nitric oxide synthesis in rats. Eur J Pharmacol. 427:69-75,2001. Masumoto A, Hirooka Y, Shimokawa H, Hironaga K, Setoguchi S, Takeshita A. Possible involvement of Rho-kinase in the pathogenesis of hypertension in humans. Hypertension. 38:1307-1310,2001. Mukai Y, Shimokawa H, Matoba T, Kandabashi T, Satoh S, Hiroki J, Kaibuchi K, Takeshita A. Involvement of Rho-kinase in hypertensive vascular disease: a novel therapeutic target in hypertension. FASEB J. 15:1062-1064,2001. Utsunomiya T, Satoh S, Ikegaki I, Toshima Y, Asano T, Shimokawa H. Antianginal effects of hydroxyfasudil, a Rho-kinase inhibitor, in a canine model of effort angina. Br J Pharmacol. 134:1724-1730,2001. Eto Y, Shimokawa H, Hiroki J, Morishige K, Kandabashi T, Matsumoto Y, Amano M, Hoshijima M, Kaibuchi K, Takeshita A. Gene transfer of dominant negative Rho kinase suppresses neointimal formation after balloon injury in pigs. Am J Physiol Heart Circ Physiol. 278:H1744-1750,2000. Shimokawa H. Cellular and molecular mechanisms of coronary artery spasm: lessons from animal models. Jpn Circ J. 64:1-12,2000.